Do younger audiences remember who Dan Rather is? Truth: Cate Blanchett and Robert Redford. Who’d you Rather? Cate Blanchett is seated before a panel of aggressive, mostly male Republican types, being grilled about her involvement in a scandalous, headline-grabbing story. A quick-to-YouTube camcorder doc titled Hillary Goes Benghazi? Not yet. Truth is, Oscar season is upon us, and Robert Redford’s banking that his portrayal of journalist Dan Rather in Truth will set him free to take home a best supporting Oscar award. All the President’s Men, co-starring Redford as Washington Post reporter Bob Woodward, was released two years after the publication of the best-seller that blew the lid off the Watergate scandal, a time when the topic was still part of the national discussion. But it’s been almost a decade since Dan Rather was forced by the cowardly shits at Viacom to step down as CBS Nightly News anchor over allegations that a story he broadcast concerning president George W. Bush’s Vietnam-era service in the National Guard was false. President’s Men boasted such illustrious above-the-line talent as director Robert Mulligan, cinematographer Gordon Willis, and screenwriter William Goldman. Truth marks screenwriter James Vanderbilt’s first time behind the camera. Prior to this, his best-known work includes Zodiac, and the two most recent Spider-Man reboots. The stolid manner in which the events play out leaves Truth feeling like a transcript of a Wikipedia page, with more expository dialog than a Woody Allen box set. Seldom has an actor done less to alter their physical appearance from role to role than Robert Redford. Hell, even John Wayne went under the latex knife to play Genghis Khan. The Way We Were takes place during and after World War II, yet Robert Redford’s thatched, “summer boy” haircut smacks of Santa Monica Pier ca. 1973. Bernstein and Woodward combined look more like Rather than Redford does, yet in this case — and with the help of his capture of the news reader’s cadence — his crusading, larger-than-life presence is a perfect fit for the subject. Blanchett stars as Mary Mapes, Rather’s producer and the author of the book upon which the film is based. Cate Blanchett is always worth watching, even when the character she plays never rises above that of a mudslinging Mary Richards. The supporting cast fluctuates between Stacy Keach — powerful as the good ol’ boy who first brought Bush going AWOL to Mapes’s attention — and Topher Grace’s insufferable comic relief. Dennis Quaid’s performance appears to have been inspired by a 1950s Encyclopedia Britannica classroom film. Do younger audiences even remember who Rather is? Will the old guard fork over the price of a senior ticket to think back on the occasion? Something tells me all the DVD screeners in the world aren’t going to arouse the attention of Academy voters. See it now, if you must, because the chances of a post-Oscar celebratory reissue are looking slim. 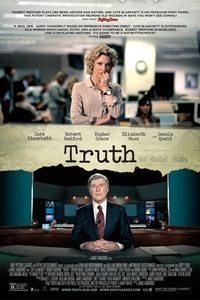 Nov. 8, 2015 @ 3:51 p.m.
Robert Redford as Dan Rather ain't Truth.